London Olympic games 2012 have officially begun after their incredible opening ceremony and now every participating country’s people are looking forward to and supporting their country’s team. No matter how much we want to, we cannot sit in front of our T.V all day long to get latest news about our favorite athletes or our country’s team. Then what should you do to stay updated with all the latest news on the go 24/7? 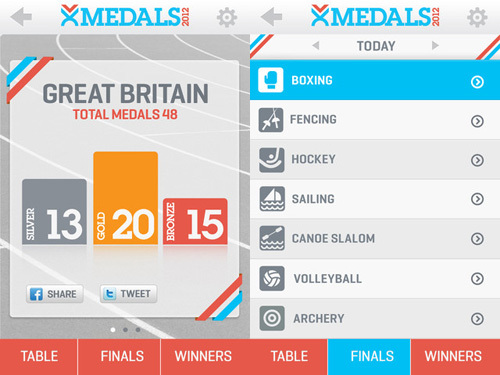 One very wise thing to do would be to get a good Olympics 2012 app if you have a smartphone. All you would have to do is to simply head over to the app store and download a good app! As the name suggests, this one is the official Olympics app. It offers latest news, results, medal tally, athlete profiles, information about games and events and games schedules for all the sports played on the Olympics. You can choose to get the updates of only a few of your favorite countries; and setting up notifications and alerts to get the latest news is also possible. BBC is the main broadcaster of London Olympics and they also have a really nice app which will keep you updated even when you are away from the TV. This app boasts 24 live streaming of Olympics. 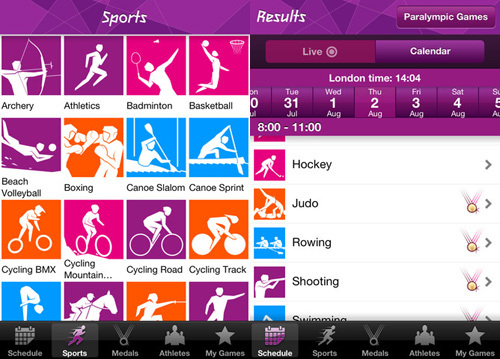 It also offers the main highlights, medal count, schedule and crowning moment of every single sport. This app is a must have for every die hard Olympics fan who wants to follow every single sport. This one is an amazing app that boasts a lot of features like schedule, sports played, countries, venues, daily updates, news and reminder etc. This app is supported in 11 different languages. It is a great app that provides you all the latest news, medal count, and countdown ticker – all this in your own (or preferred) language! OlympiCals refers to Olympics+Calender, which simply means that this app can help you get Olympic schedules in your Calendar! This app allows adding the Olympic schedules including live results to your iPhone calendar so that you can stay updated all the time. You can add the schedules by sport, country or athlete. 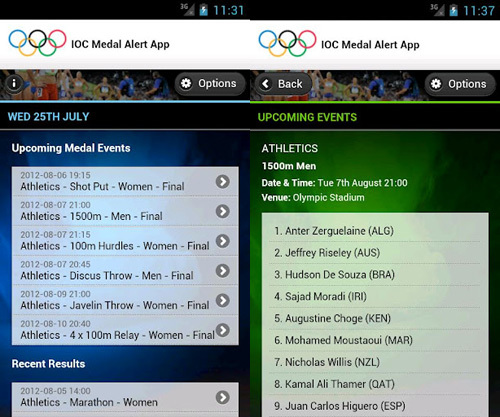 If you wish to get the latest breaking news about the Olympic games 2012, then this app is perfect for you. 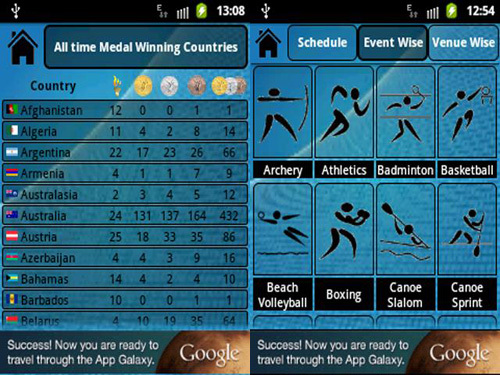 This app provides you with all the latest news, videos, photos, results, schedules and medal tally for each sport. Allowing Push notification will enable you to get breaking news, results and programming reminders for your country’s team. This one is a comprehensive medal count app. It tells you how many gold, silver or bronze medals each country has won. It also gives you the schedule for every event Final in Olympics. It is a really nice app for keeping tabs on the medal count! CTV Olympics London 2012 will prove to be a useful app for those who only want to get the highlights and breaking news. This app offers minute by minute updates of results and news, and video highlights of every game. This one is simple, hassle free and to the point app. 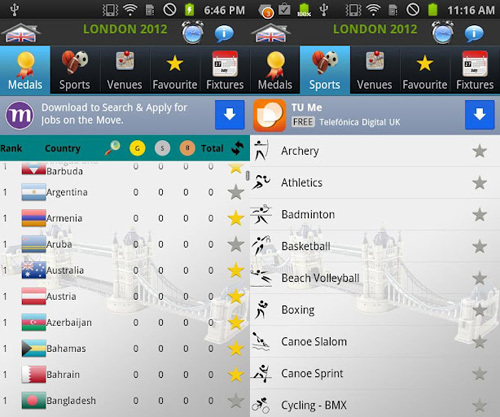 London Olympics 2012 Ultimate is only available for Android phones. This app allows following your favorite countries and getting latest updates as to if they are winning or losing. This app provides you with a detailed event schedule in your local time, so that you won’t have to spend your time and energy in trying to convert the timing into your local time. It also tells you the medal count for all the countries and the latest rankings. The name says it all. This one is a really cool app that will inform you right away when a medal is won in your favorite sports, team or by your favorite athlete. Simply select the event of your choice and get sms and text alerts whenever it is taking place. This app will also provide you the latest results. London 2012 Schedule is a Facebook, Twitter and G+ integrated app. As the name hints, this app provides you with schedule (Date, Event or Venue wise), latest news, medal count/table and country information etc. Setting reminders for events in local time using this app is also possible. I think all these amazing apps are meant for people who don’t get time to watch the Olympics live, following their favorite sport becomes easier now with the help of these apps. Thanks for the great app suggestions. I just downloaded OlypiCals and Medals 2012 so I can keep track of the events I want to watch and to keep tabs on the medal totals. I have been able to watch some of the games on TV but because of my hettic work schedule at DISH I really haven’t had the time to sit down and watch. Instead, I have been using my DISH Remote Access app to watch because it lets me stream all of my live TV channels no matter where I am. I guess between the 3 apps I should have all of the Olympic coverage I could need.